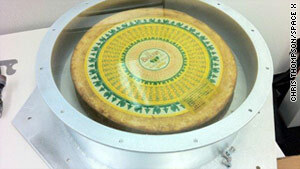 A wheel of Le Brouere cheese was the secret cargo aboard the SpaceX Dragon. (CNN) -- Call it one small step for a cheese, one giant leap fromage-kind. A wheel of Le Brouere cheese was the secret cargo aboard the SpaceX Dragon, the first commercial spacecraft to be recovered from Earth orbit, the company revealed Thursday. SpaceX co-founder Elon Musk hinted at the cargo after the capsule's successful splashdown in the Pacific Ocean on Wednesday afternoon, suggesting it had something to do with the British comedy troupe Monty Python. The block of fermented curd was a nod to one of the group's best-known sketches, "Cheese Shop." The wheel, described only as "very big," was being towed back to California aboard a barge along with the spacecraft and "basking in the glow of being the first cheese to travel to orbit on a commercial spacecraft," company spokeswoman Kirstin Brost told CNN. In another comedy reference, the payload was bolted to the floor of SpaceX's Dragon 9 spacecraft in a circular drum bearing a picture of a cow and the warning "Top Secret!" -- a nod to the 1984 spoof by the creators of "Airplane!" The Dragon was launched into low-Earth orbit on Wednesday from Florida's Kennedy Space Center and splashed down about 500 miles off the coast of Southern California about three hours later. It was the first flight under NASA's Commercial Orbital Transportation Services program, which aims to develop commercial supply services to the international space station.